By Clare B. Dunkle. New York: Atheneum, 2009. A sequel to The Sky Inside. A science fiction novel for ages ten and up. Martin Glass may have seen his baby sister Cassie to safety at the end of The Sky Inside, but his problems are far from over. There's a totalitarian regime in place, murderous game shows on the air, and a host of government agents on Martin's tail. And Martin and his Alldog, Chip, get more than they bargained for when they go back to Martin's old suburb and have to rescue Martin's parents. But spending time in the wilderness with Mom and Dad isn't the worst of it. Because Martin learns that Cassie is still in danger—and to keep her and the other Wonder Babies safe, he's going to have to risk the thing he loves most. Clare Dunkle brings her signature sense of pacing an adventure to a new story of Martin, Chip, and the rest of her varied cast in a story that widens and deepens the fascinating and multifaceted world she presented in The Sky Inside. Buy THE WALLS HAVE EYES in hardcover. 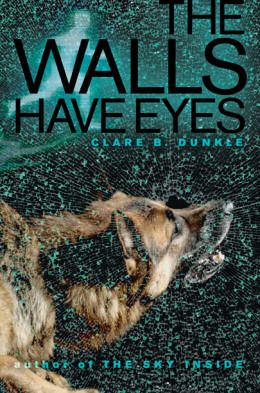 Buy THE WALLS HAVE EYES in Kindle edition. "A great pick for reluctant readers"
"If writers like Dunkle find the readers they deserve, perhaps the next generation's response to the moral and political conundrums they face will be better thought out than those of the present generation." "A fantastic book that all middle school children will truly enjoy"
"Comforting, enjoyable adventure ... In a genre populated by gifted, destined and otherwise special child protagonists, Martin's pure normality is a breath of fresh air." "Can I hope for a 3rd book?" Text and image courtesy of Simon & Schuster Children's Publishing Division.